Thrips infestations can reduce onion yield by as much as 20%. Onion thrips also vector Iris Yellow Spot Virus. Onion thrips thrive in hot, dry conditions and are usually more damaging where these conditions prevail most of the production year. Pest monitoring Although thrips feeding during the early bulbing stage is the most damaging to yields, thrips must be controlled before onions reach this stage. Otherwise, populations might exceed levels that can be controlled adequately. In California, a reliable means of evaluating thrips populations is to randomly sample entire onion plants. Larva stages tend to congregate around the newest leaves of the plant. Sample at least five plants from four separate areas of the field. 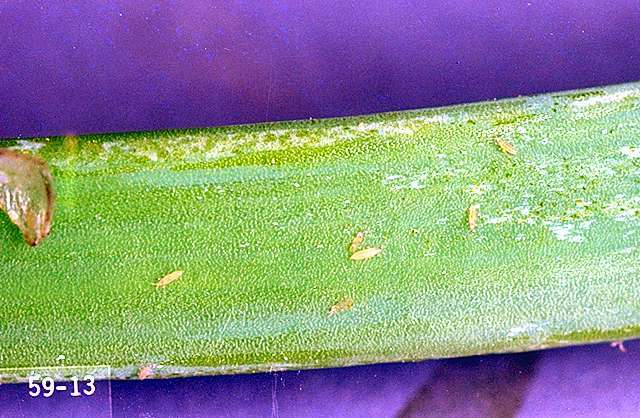 Early in the season, an average of 5 thrips per plants warrants control measures. A threshold of 30 thrips per plant mid-year (lower for very young plants and higher for larger mature plants) has been used successfully for dry bulb fresh market and drying onions. The marketability of green onions (those marketed fresh with the leaves attached) is severely reduced by thrips scarring. Apply treatments at the first sign of thrips feeding. Avoid planting onions near grain fields, if possible, because thrips numbers often build up in cereals in spring. Onion grown with overhead irrigation tend to have lower thrips numbers as thrips tend to be washed from the plant to some extent with heavy irrigation or rains. Thorough coverage is essential for control, as most thrips feed in protected areas of the plant. abamectin (Agri-Mek 0.15EC ) at 0.009 to 0.019 lb ai/a. PHI 30 days. REI 12 hr. Retreatment interval 7 days. Do not exceed 0.019 lb ai/a per season. acetamiprid (Assail SG) at 0.094 to 0.15 lb ai/a. PHI 7 days. REI 12 hr. Retreatment interval 7 days. Do not exceed 0.6 lb ai/a per season. Chenopodium ambrosioides extract (Requiem 25EC) at 3 to 6 pints formulated product per acre. REI 4 hr. Use high rate when conditions are favorable for heavy pressure. OMRI-listed for organic use. cyantraniliprole (Exirel) at 0.088 to 0.133 lb ai/a. PHI 1 day. REI 12 hr. Retreatment interval 5 days. Rotate with other modes of action. Begin applications early for best results. Do not exceed 0.4 lb ai/a per season. cyantraniliprole + abamectin (Minecto Pro) at 7 to 10 fl oz/A. PHI 30 days. Do not apply more than two times in a row. Retreatment interval 7 days. Do not apply more than 20 fl oz/A per season (0.18 lb ai/a of cyantraniliprole and 0.038 lb ai/a of abamectin). cypermethrin (Holster) at 0.08 to 0.1 lb ai/a. PHI 7 days. Dry bulb onion only. REI 12 hr. Retreatment interval 7 days. Do not exceed 0.5 lb ai/a per season. Do not graze or feed crop residues to livestock. deltamethrin (Delta Gold) at 0.018 to 0.028 lb ai/a. PHI 1 day. REI 12 hr. Retreatment interval 5 days. Do not exceed 0.112 lb ai/a per season. gamma-cyhalothrin (Declare) at 0.010 to 0.015 lb ai/a. PHI 14 days. REI 24 hr. Retreatment interval 5 days. Do not exceed 0.12 lb ai/a per season. An oil or nonionic surfactant improves control. lambda-cyhalothrin (Warrior II) at 0.02 to 0.03 lb ai/a. PHI 14 days. Bulb onion only. Retreatment interval 5 days. Do not exceed 0.24 lb ai/a per season. An oil or surfactant adjuvant improves control. malathion (Fyfanon 8E) at 1 to 1.56 lb ai/a. PHI 3 days. REI 12 hr. Retreatment interval 7 days. Limit 2 treatments per season. Metarhizium anisopliae (Met 52EC) at 40 to 80 fl oz/100 gal as drench or 0.25 to 2 quarts/a. PHI 0 days. REI 4 hr. methomyl (Lannate SP) at 0.9 lb ai/a. PHI 7 days. REI 48 hr. Do not exceed, per season 5.4 lb ai/a for green onion or 3.6 lb ai/a for dry bulb onion. Limit 8 treatments per season. Retreatment interval 5 days. oxamyl (Vydate L) at 0.5 to 1 lb ai/a. PHI 14 days. REI 48 hr. Dry bulb only. Do not harvest tops. Do not exceed 4.5 lb ai/a per season. Suppression only. oxydemeton methyl (MSR) at 0.375 to 0.5 lb ai/a. PHI 30 days. REI 10 days. Do not exceed 1 lb ai/a per season. Retreatment Interval 14 days. Additional 2ee registration for Idaho for side dress application. permethrin (Ambush 25WP) at 0.15 to 0.3 lb ai/a. PHI 1 day. REI 12 hr. Dry bulb onion only. Do not exceed 2 lb ai/a per season. pyriproxyfen (Knack) at 0.067 lb ai/a. PHI 3 days. REI 12 hr. Do not exceed 0.134 lb ai/a per season. Retreatment interval 14 days. spinetoram (Radiant SC) at 0.047 to 0.078 lb ai/a. PHI 1 day. Retreatment interval 4 days. Do not exceed five applications or 0.234 lb ai/a per season. Follow resistance management procedures on the label. spinosad (Success) at 0.063 to 0.125 lb ai/a. PHI 1 day. REI 4 hr. Retreatment interval 4 days. Do not exceed 0.45 lb i/a per season. For suppression. Some formulations are OMRI-listed for organic use. spirotetremat (Movento) at 5 fl oz/a. PHI 3 days. Retreatment interval 7 days. REI 24 hr. zeta-cypermethrin (Mustang) at 0.0375 to 0.05 lb ai/a. PHI 7 days. REI 12 hr. Retreatment interval 7 days. Do not graze or cut for feed. Do not exceed 0.25 lb ai/a per season. Pesticide resistance management Resistance to organophosphate has been documented in several states and is suspected in California. For this reason, alternate insecticides from different chemical families when multiple treatments are needed during a year. Be sure to use surfactants when recommended by the label as thrips reside down in the neck of the onion plant and contact of the chemistry to thrips is important.